On this page we will assemble resources that may be helpful in designing curriculum around indigenous contributions to textile traditions that live on in Oaxaca and in Mesoamerica, more broadly speaking. One place to start in the study of Mesoamerican textiles could be with images of manuscripts authored by indigenous scribes and painters. 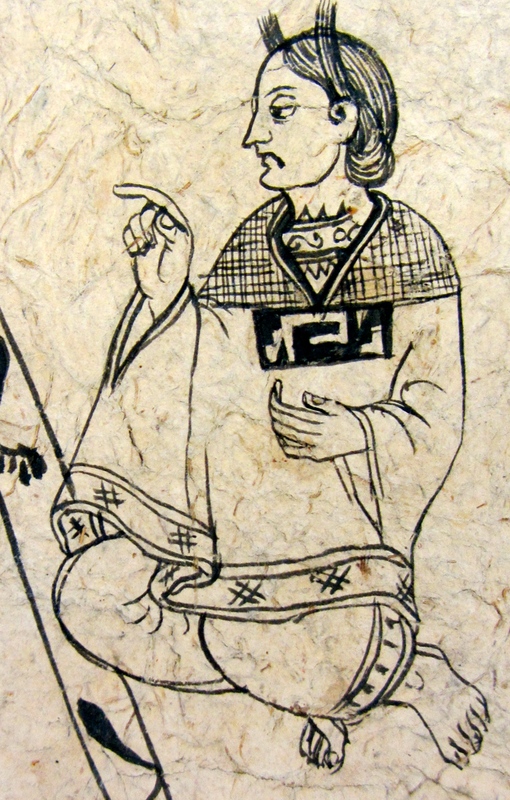 Below, we see a detail from the fragment of the Lienzo de Tlaxcala (sixteenth-century pictorial housed in the Benson Library, University of Texas at Austin). 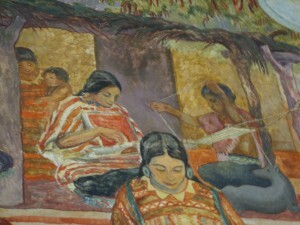 It shows indigenous women wearing and holding clothing that they likely wove by hand. The detail is especially good in this image. We see a number of design variations. Only Marina wears shoes, suggestive that she was of another ethnicity, a higher status, or had already been influenced by European ways, having been working as the interpreter to the Spanish conqueror, Hernando Cortés. Of the three other women who are named in the glosses, one has been baptized (having been given the name “Luisa” before her Nahua name). 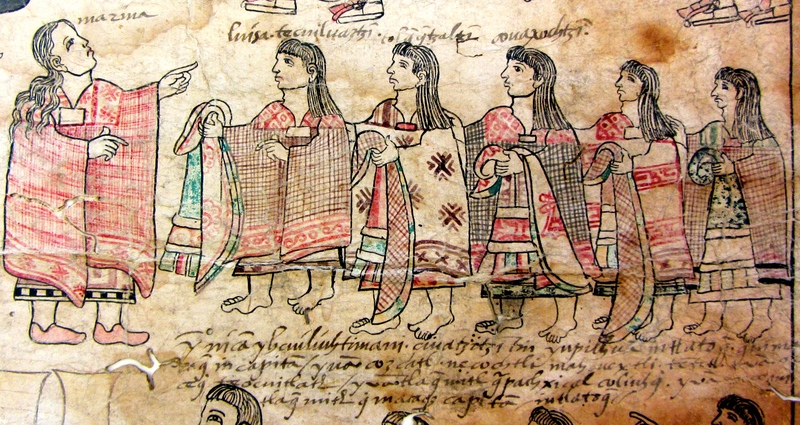 In another sixteen-century manuscript housed at the Benson Library we find this detail (below) of a Nahua maiden (cihuapilli) in clothing that shows some of the fine details of the weave and/or decorations on the fabric. The hairstyle is that of an elite woman, living a sedentary life. The pointing finger indicates that she had some authority or status. Notice the detail in the rectangle over her chest, a white design on a black background. It is reminiscent of some of the designs we will see on buildings in Mitla, even though those designs gracing architecture are not from the Nahua culture. They may be pan-Mesoamerican, at least to some extent. Stone carvings from pre-Columbian Zapotec communities around the valley show remarkable affinities to the designs that we still see woven into textiles. For a PowerPoint about the text, context, subtext, and intertextuality between textiles and other forms of expression in indigenous traditions, please see: Mesoamerican Textiles: Text, Subtext, and Context (bilingual; by Stephanie Wood and Blanca Aranda). Justin Kerr’s photograph of a stone carving at the archaeological site of Yagul is clearly reminiscent of a textile pattern. We will see similar patterns when we visit Mitla. 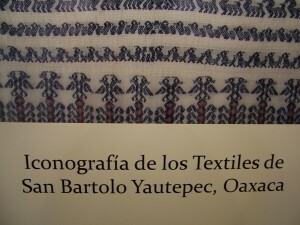 In a display of designs from San Bartolo Yautepec (a community in the southeast of Oaxaca city, in the state of Oaxaca) held at the Museo Textil in 2009, we captured some details that convey the intended meaning behind certain symbols incorporated into that community’s textiles. 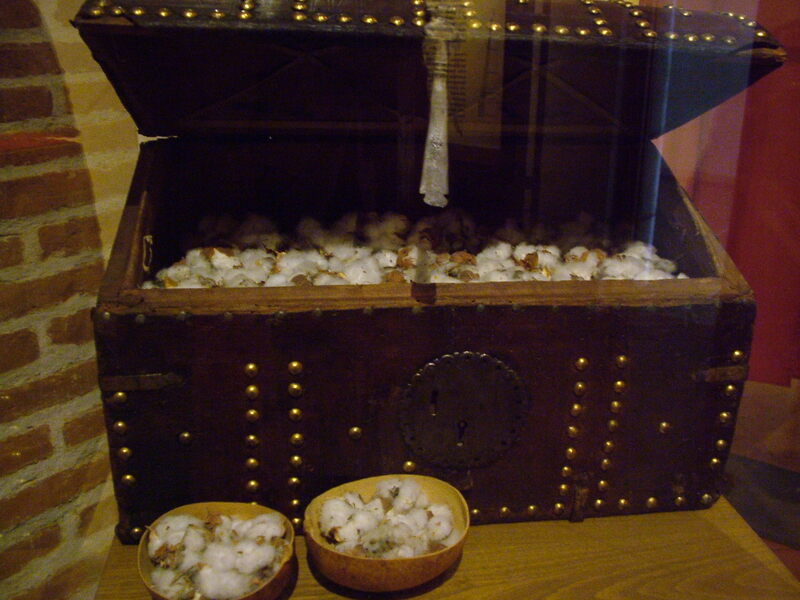 This kind of research could be done for any number of textiles from a great many communities. Can you spot the repeating design of the two-headed bird in the textile above? 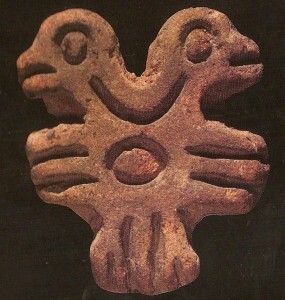 Below, people from the community have identified some recurring motifs in their textiles, including two different versions of the gavilán bicéfala (two-headed sparrowhawk). This is reminiscent of the two-headed eagle of the Habsburg dynasty in Europe, which also found its way into Mexican textiles. The motif of two-headed birds, known in Europe, is also found to be indigenous in art of the Americas, as we see in the example of a Maya stamp from Classic-period (pre-Columbian) Guatemala, below. Weaving on the backstrap loom (going around a woman’s waist and with a connection to a tree or pole) has been an activity that dates from pre-Columbian times and is still practiced today in indigenous communities across Mesoamerica. 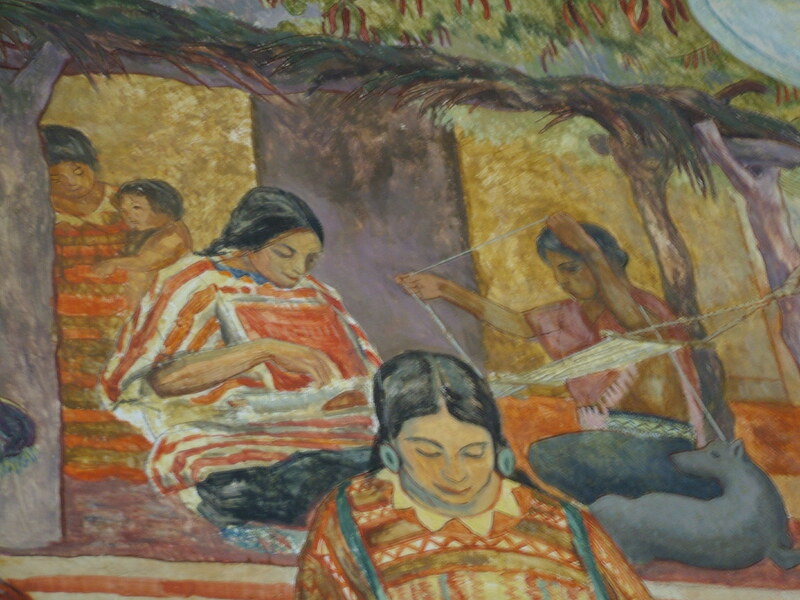 In this detail below from the mural by Arturo García Bustos, in the municipal palace on the zócalo, we see an indigenous woman weaving with a backstrap loom. 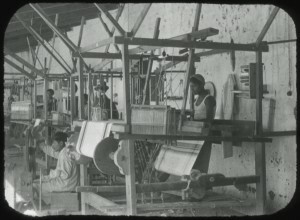 This black and white photograph (from a slide), dating from the 1930s or 40s, shows that men also used the backstrap loom on occasion. 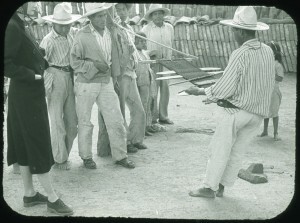 The photographer is unknown, as is the exact location, other than knowing it is somewhere in the state of Oaxaca. 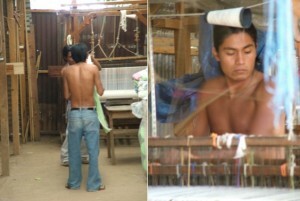 Man demonstrating the backstrap loom. 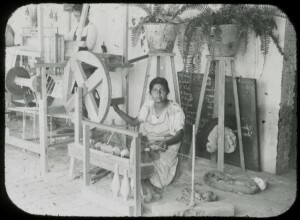 Woman preparing spindles. Somewhere in Oaxaca, ca. 1930s or 40s. Men working floor looms, ca. 1930s or 40s. 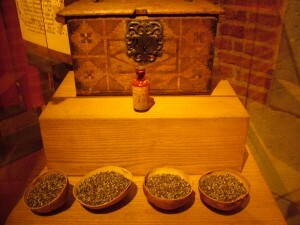 Floor looms were introduced by Europeans. 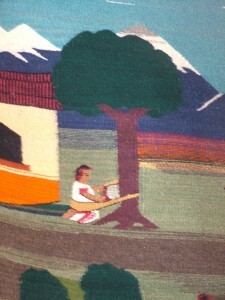 Men began weaving more after the introduction of floor looms. Many textile workshops today emphasize male labor. 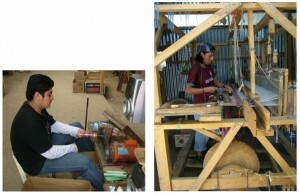 It can be hot work during certain parts of the year in Oaxaca. Men sometimes work with their shirts off. Below we see an indigenous woman (Triqui, perhaps) dyeing yarn for making textiles. 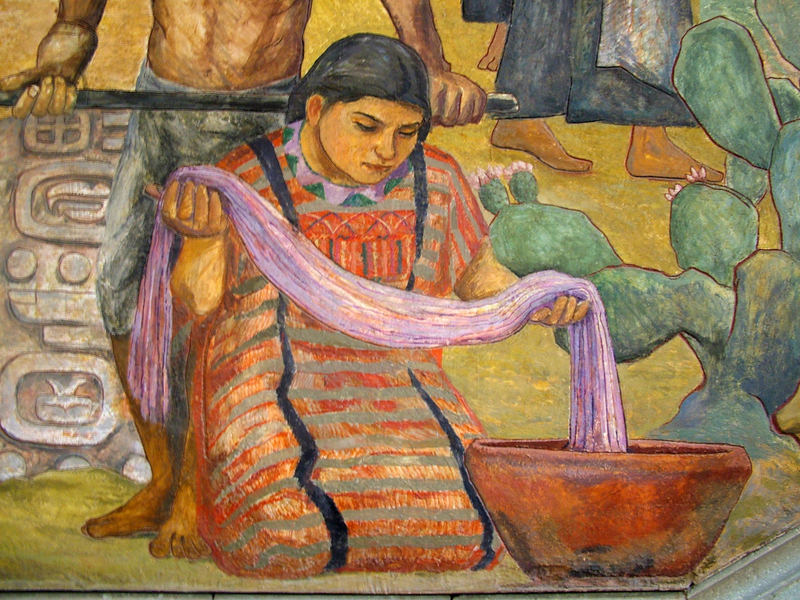 This is a detail from the García Bustos mural about Oaxacan life that is found in the former municipal palace on the zócalo. We will see demonstrations of natural dyes when we visit Teotitlán del Valle and meet with Paco González and Petra Vicente. 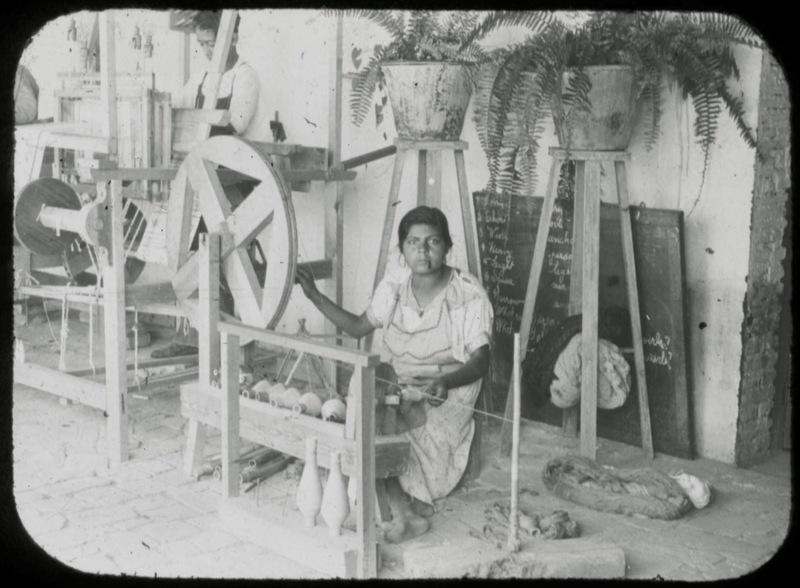 Although European colonization changed things, indigenous women held the primary role in producing textiles in Mesoamerica over the millennia, and many are still very active in this work. In this Mesolore interview with Alejandro de Avila, who helped establish the textile museum in Oaxaca, we hear about weaving and women’s textile production (go to the point a big beyond 7 minutes in the video). 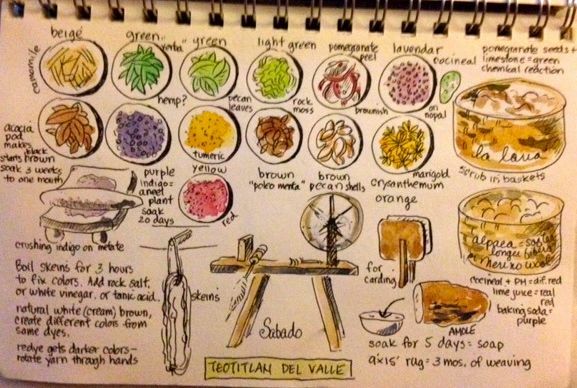 Pearl Lau (NEH Summer Scholar, 2010), made this study of natural dyes while in Oaxaca in 2014. 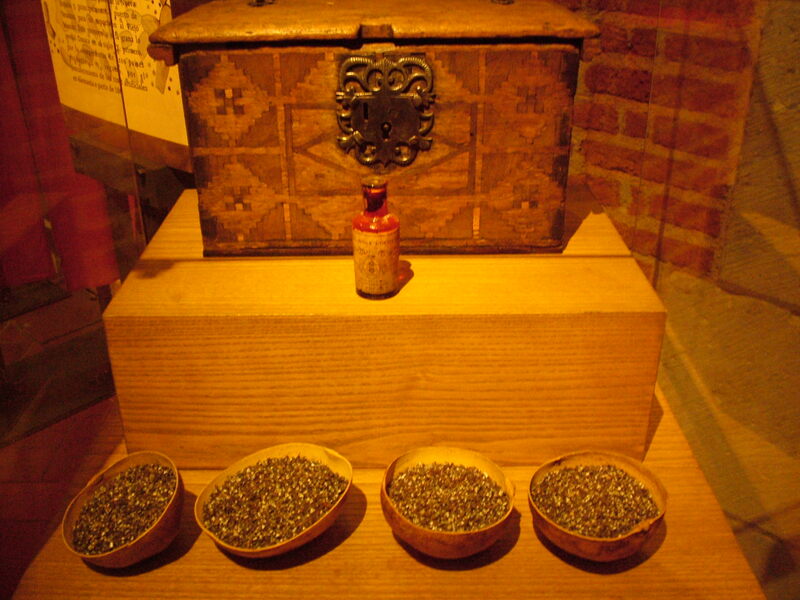 The Spanish colonial era in Oaxaca saw the commercial production of the pre-Columbian red dye, cochineal, skyrocket along with the industrialization of textiles in Europe. The Spanish era was also a time when cotton production took off in Oaxaca. 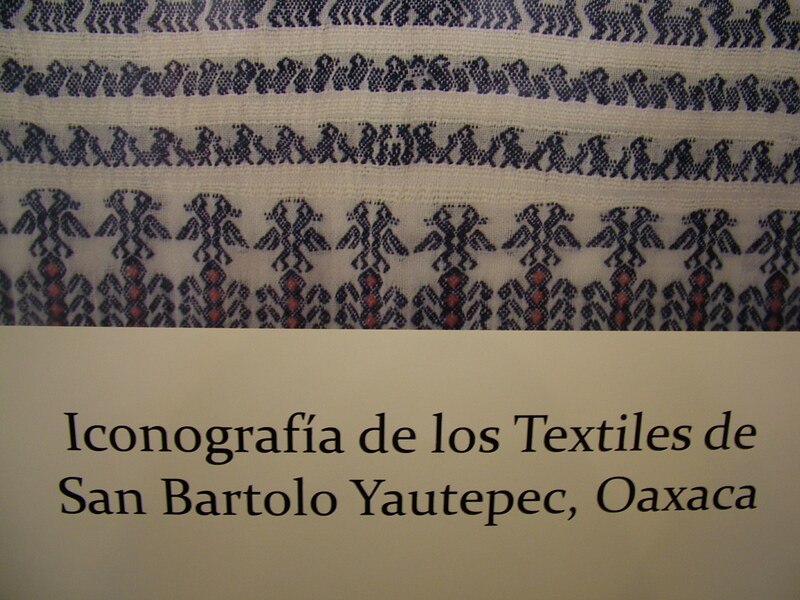 See also our pages on Teotitlán del Valle, the Textile Museum, and San Agustín Etla, where we have more information and images about textiles.